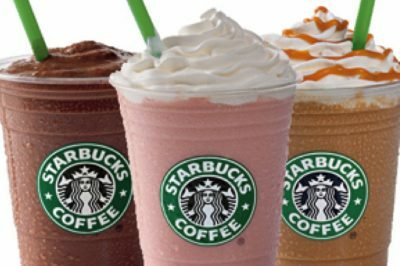 This popular Starbucks frap gets its red color from the dye of ground up bugs. In an unexpected and disheartening surprise, it turns out that the Strawberries & Creme Frappuccino at Starbucks got its pink-red color from cochineal extract, which is a fancy way of saying ground-up bugs. The exact ingredients for the chain’s drinks were either not well-known or not understood, because it took one concerned, vegan barista to notice the ingredient for the red sauce that goes into the frap and take a picture for proof. The barista then uploaded the photo to a vegetarian website called This Dish Is Vegetarian to reveal that, in fact, the Strawberries & Creme Frappuccino was notvegetarian. 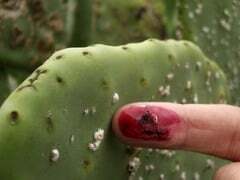 Cochineal insects are native to Mexico and South America, living their tiny lives on prickly pear cactus plants. The female insects eat the red berries on the cactus and turn red from the juice, making their bodies one big concentration of red dye. These females are harvested for about three months and are then collected to extract the dye. For several minutes, the farmers shake the insects until they are all dead while still maintaining their dark color. Other methods of extraction include using a vat of hot water or an oven. Either way, it’s a pretty cruel way to die. The dead bugs are then left out to dry and shaken once more to remove excess residue. All in all, it takes about 70,000 bugs to produce just one pound of cochineal dye. Starbucks is certainly not the only one to use these bugs as “natural” dyes for their products. It’s used to color a variety of red items, such as gelatin and makeup. Companies like Tropicana and Dole list the dye on the list of ingredients for their fruit juices. Apparently Starbucks got the message because it announced shortly after this ingredient was revealed that it would be transitioning away from cochineal extract and would instead use lycopene, a tomato-based extract. Thankfully the barista from Starbucks made the nation aware of the bug extract, or U.S. customers would likely still be inadvertently drinking dead bugs for years to come. What are your thoughts on the use of cochineal extract? Please comment on, like, and share this article!